It’s time for pumpkins! No, I am not talking about pie, I am talkin’ soup. This amazing recipe is light and creamy and super fun to make – you cook the soup inside of a whole pumpkin! I guarantee that if you put this dish on the table, your kids will be begging to try it. The natural sweetness of the pumpkin makes for an incredible delicate taste to cozy up to on a cool fall night. Heat your oven to 375 degrees. Make a lid for the pumpkin by cutting around the stem. The hole needs to be large enough for you to scoop out the insides. Remove the seeds and pumpkin fibers. Brush the outside and lid of the pumpkin with vegetable oil, as well as the inside of a large casserole dish (needs to be large enough to hold the pumpkin). Combine butter, onion, garlic, apples, chicken broth, and heavy cream inside of the pumpkin. Season with some salt. Place the lid of the pumpkin back on the pumpkin. Bake for 1 1/2 hours. Remove the lid and add goat cheese, pumpkin pie spice, and thyme. Mix together and bake for an additional 30 minutes, uncovered. Remove the pumpkin from the oven and pour the liquids into a blender. Use a spoon to gently scrape most of the flesh from the inside of the pumpkin. Place the scraped pumpkin flesh into the blender. 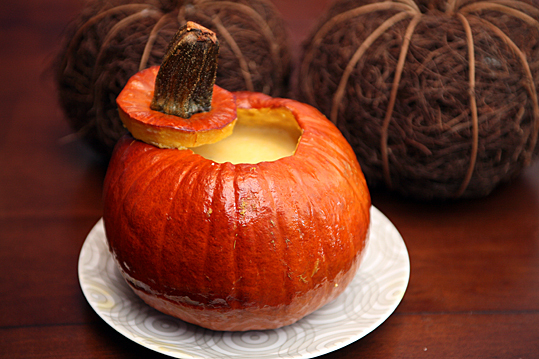 Blend to the desired consistency and pour soup back into the whole pumpkin. Be careful, the pumpkin will be fragile. The soup is now done and ready to be immediately served.